Extreme hot sauce are we going too far? In a report on the BBC in April a man ate a Carolina Reaper pepper and ended up in hospital with a massive migraine. 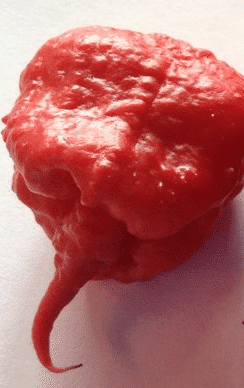 Doctors seem to think the pepper constricted the blood to his brain. LINK to story on BBC. How did we get here? Well starting with Tabasco people have loved hot sauce for over 100 years. In the Caribbean hot sauce or pepper sauce is used daily on almost all meals. In fact as I often tell people on farmers markets if you go into KFC or Pizza Hut in Trinidad they offer you three sauces, ketchup, mustard and hot sauce all in sachets. Hot peppers are grown all over the Caribbean the most popular being scotch bonnet which we use in our Ooft! Aged Hot Sauce. So farmers noticed over time natural hybrids and began to name them, so in Trinidad there was a kind of blistery looking pepper and boy it was hot so they called it 3 pot as it could be used three times “in the pot”. So to get this, cooks in Trinidad pop a whole pepper into a stew or soup to add flavour. If it doesn’t burst then its mostly flavour with a little heat. So a 3 pot could be retrieved and used again. Later another farmer found an even hotter and named it 5 pot and later still a hotter named 7 pot. One farmer found a variety growing with a tail and named it Scorpion as that’s what it looked like. After all the scotch bonnet got its name because it looked like a tam o’ shanter hat. What does Ooft! think of all this? Well we don’t follow fashion. Our sauce is based on scotch bonnets slow aged to develop flavour not heat. Yes its a hot sauce but chasing the heat for us misses the point. Hot sauce is not just heat its taste and we have tried so many other peppers to make a different sauce and just cannot match the taste of scotch bonnets. On your table you want salt and pepper and hot sauce, not a sauce that will give you a headache, but a sauce that will improve your food and make it come alive.